Día de los Muertos, Day of the Dead, is a holiday originally celebrated in the southern and central parts of Mexico and increasingly observed in the United States. It combines pre-Hispanic rituals that honor deceased relatives with the Catholic celebrations of All Saints’ Day and All Souls’ Day. It is said that at midnight on October 31, heaven opens its gates and the spirits of those who have passed can return for a day to visit their loved ones. The holiday is really two days: Día de Todos los Santos (or Angelitos, meaning little angels) is observed on November 1 to honor children who have died. Día de los Muertos on November 2 celebrates the memories of deceased adults. Ofrendas, or offerings, are a central theme of the holiday. Families create altars to display the ofrendas and to welcome departed loved ones into their homes. Traditionally, altars with multiple levels represent heaven and earth, or heaven, purgatory and earth. And it is said the fruit, fluttering papel picado (brightly colored cut tissue paper banners), candles and cup of water represent the four elements: earth, wind, fire and water. An altar built in a home might be small and simple, created on a side table with a just a photograph or candle. More often, they also include the loved ones’ favorite foods and important objects and might even feature photos and belongings from many family members and friends, taking over a whole table. Children sometimes learn the tradition by making their own miniature altars in shoeboxes. Other Day of the Dead decorations include papel picado, cempasúchil (orange marigolds), copal (incense) and calaveras (skulls made of sugar and decorated with colorful frosting). A cup of water, dish of salt and pan de muertos (a sweet bread for the dead) symbolically refresh the visitors and relieve their hunger. You might also find altars at schools, parks or businesses. They’re created to honor not only family members and friends, but also historical figures, celebrities or those lost in disasters or tragedies. On Día de los Muertos, families visit graveyards, but it’s not a somber occasion. They take a feast, clean and decorate tombs, light candles, and sing and play games. Children learn that death is part of life and that their deceased relatives would want to see them happy. Even the calacas—decorative paper-mache skeletons—are shown having fun. Some cities celebrate with parades, processions and street parties. Different regions mark the holiday in different ways, but one thing is true everywhere: Day of the Dead is a time to gather with loved ones past and present, tell family stories and celebrate their relationships. Día de los Muertos is a deeply personal holiday. The process of creating an ofrenda is a chance to remember the details that made the people you love—and your relationships—unique. Celebrations are full of tears and laughter, stories and songs, quiet moments and joyful outbursts. Day of the Dead is ultimately about life and love and the connections that keep people together even after death. Hallmarker Maria Villa made her first ofrenda when her mother passed. Putting together and displaying her mom’s favorite things helped Maria find joy in her grief. Read Maria’s story here and learn how to make a Day of the Dead altar. Children whose families celebrate Día de los Muertos might decorate—and eat!—calaveras, miniature skulls made of sugar. Some paint their faces to look like calaveras adorned with bright flowers and patterns. Download this free coloring page to decorate your own sugar skull here. 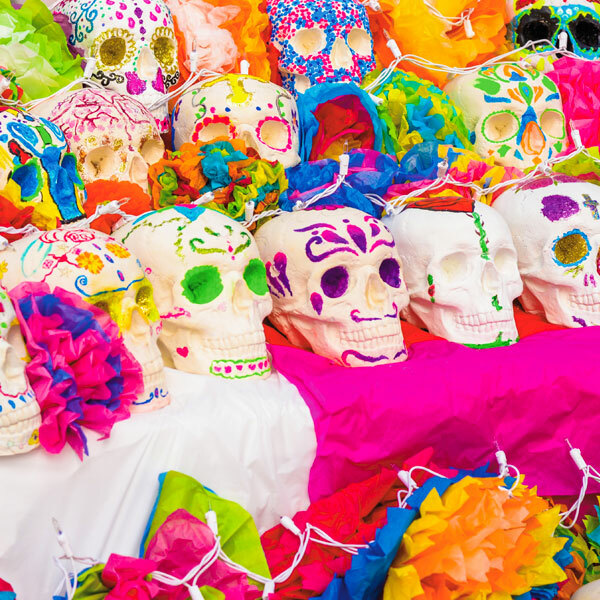 Hallmark Photo Stylist Betsy G. fell in love with the Day of the Dead traditions on her travels to Mexico and shares them with her friends in Kansas City. Check out here story here. It’s not always easy finding the words to write in a get well card. We want to offer what comfort we can.